Back when I worked as an assistant animator at Kroyer Films, (Ferngulley the Last Rainforest.) we had a visit from two famous animators, Ollie Johnston and Frank Thomas. 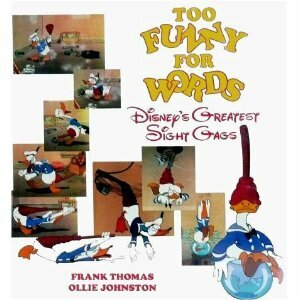 I managed to get my copy of their great book Two Funny for Words; Disney’s Greatest Sight Gags signed before Bill Kroyer chased us kids away, as if we were bothering them. The book is currently out of print, with used prices starting at about $15. That’s an incredible value. I can’t recommend it enough as a great resource for understanding classic comedy techniques. I have selected some excerpts from the book to share here. It will seem a little random, but I’m sure you will be able to sort it out and learn a few things. In addition to presenting all aspects of drawing and composition, these classes included screenings of the classic comedies starring such talents as Charlie Chaplin, Harold Lloyd, Buster Keaton, and Laurel and Hardy. Whenever a famous vaudeville act would come to town, Walt bought tickets for his top men to be sure they would see these fine performances and remember them. On finding the unique personality in Walt’s characters. About growing from the simplicity of the early shorts to the more developed stories. In these early pictures, he was looking for refreshing, intriguing, unexpected, related occurrences, that would increase the enjoyment of the film. Walt began to discover his exceptional talent as a storyteller as he built these little dilemmas into a full plot. These were not carefully organized story lines, because Walt was never interested in structure. He knew what was funny and what would hold an audience, and he taught us never to load a picture up with logic. Grab the audience’s interest first, and the best way to that is with laughter. Whether we recognized it or not, the key to Disney humor had been found. It was simply this: the right gag in the right predicament, for the right personality. I will transcribe more for tomorrow.